"When you are living the best version of yourself, you inspire others to live the best version of themselves." 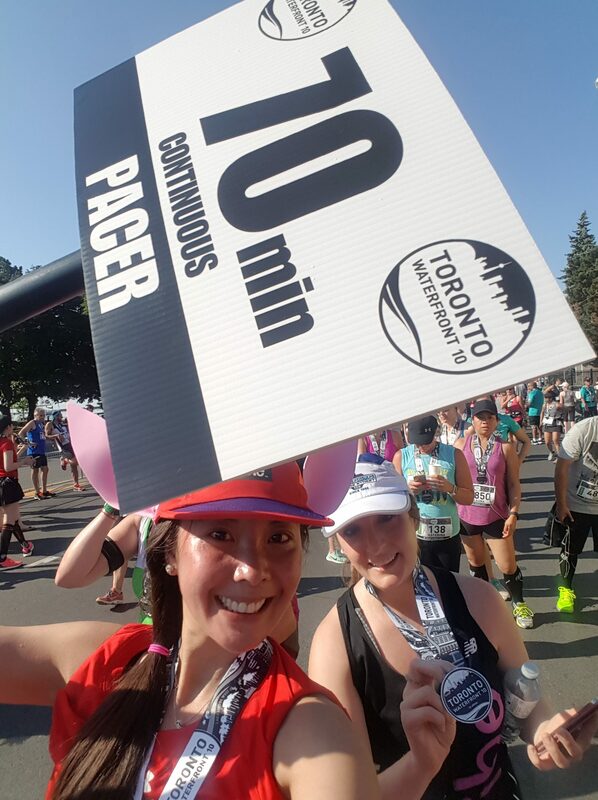 The inaugural Toronto #Waterfront10 was so much fun! 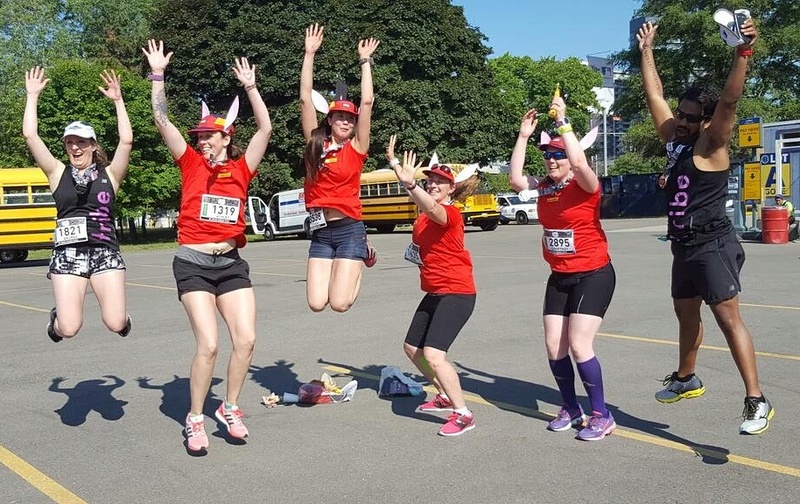 The energy was live and it was great to see all my fellow Toronto runners. Registration was pretty reasonable for this race and there were early bird specials as well. As with other 10k’s, it was fair betwen the $40 – $60 (depending when you register) price range. The race kit pick up was at the St. Lawrence market in Toronto. The fun thing about the race expo was that there was free yoga offered by Tribe Fitness. Two 45 minute yoga sessions were offered on both kit pick-up days. It was a good way to stretch out before the race. We were even given free Powerbars after the yoga too! There was also a Canadian flag that we had the chance to sign to write our wishes to our Canadian marathoners heading to the Rio 2016 Summer Olympics: Reid Coolsaet, Eric Gillis and Krista DuChene. The good thing about early morning Saturday races in Toronto is that the subway is running! Sunday races are always a must-drive or carpool situation. I was able to drive my car to the subway station and take the subway down for the race. 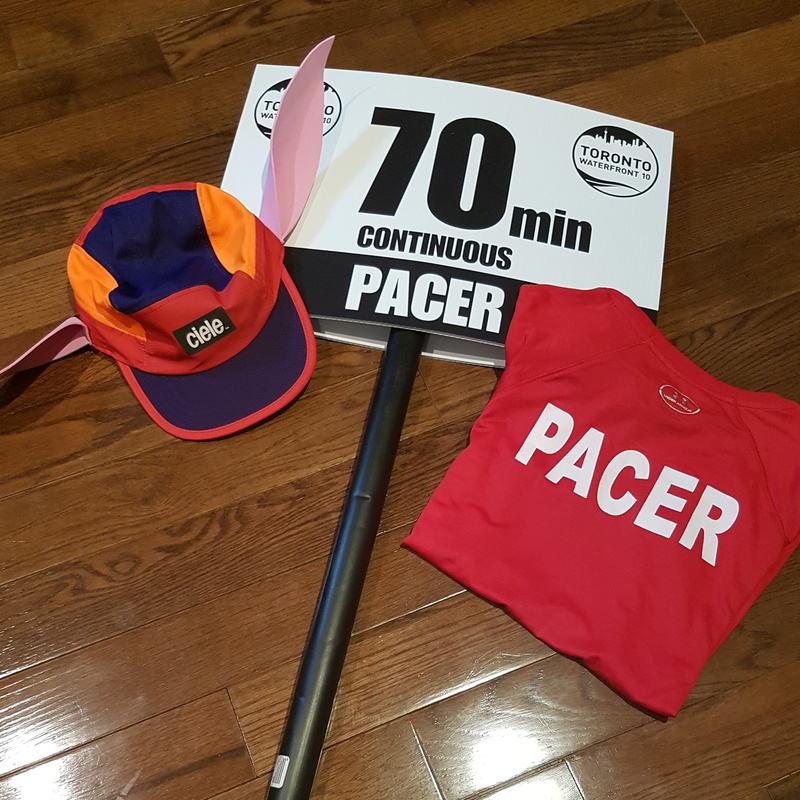 I probably looked weird carrying my pacer sign on the subway. 🙂 There were quite a few people commuting by subway as well and the stop was right at the start line of the race so that was great. It was well organized with visible signs for on site race kit pick-up, bag check and your coloured corrals. The line up for the porta potty was super long! I was waiting in line to use it before heading to my corral and this made me late for my team pacer photo. 😥 I’m sad I missed the photo but I had to go and I needed to be in my spot in the corral so that runners were able to see my sign. The course went south on University and then along the Lakeshore. 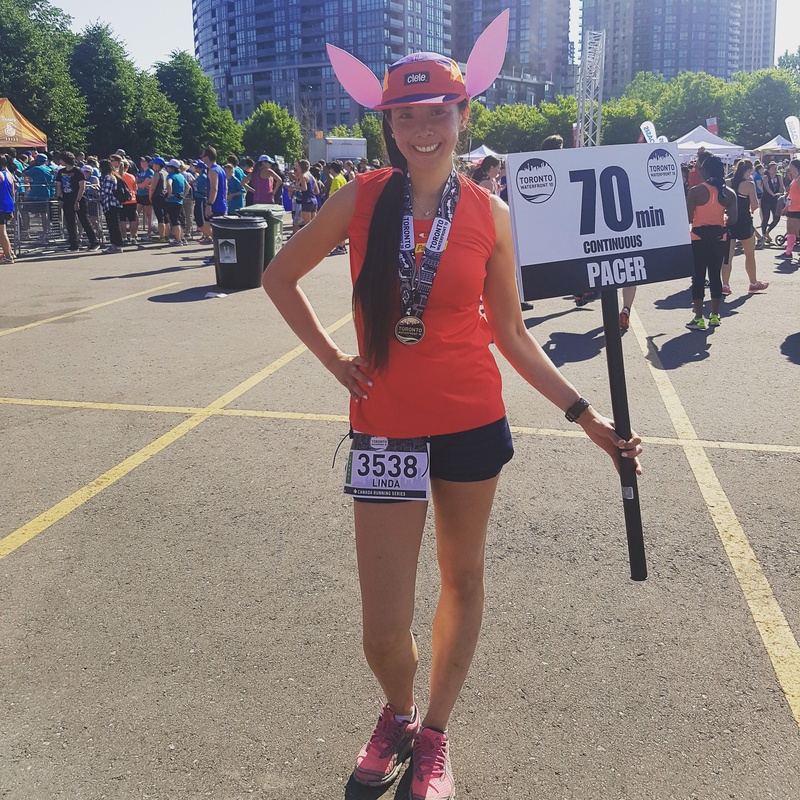 It was a nice scenic course and reminded me of the Scotiabank Toronto Waterfront Marathon. It was fun to see the runners coming back to the finish and giving high fives along the way. There were water/Gatorade stations at around 3k, 5k and 9k. It was good to have the three stations (5k and 9k were the same stations out and back). It was super hot and there were two areas with cooling fans as well. Those were definitely needed. 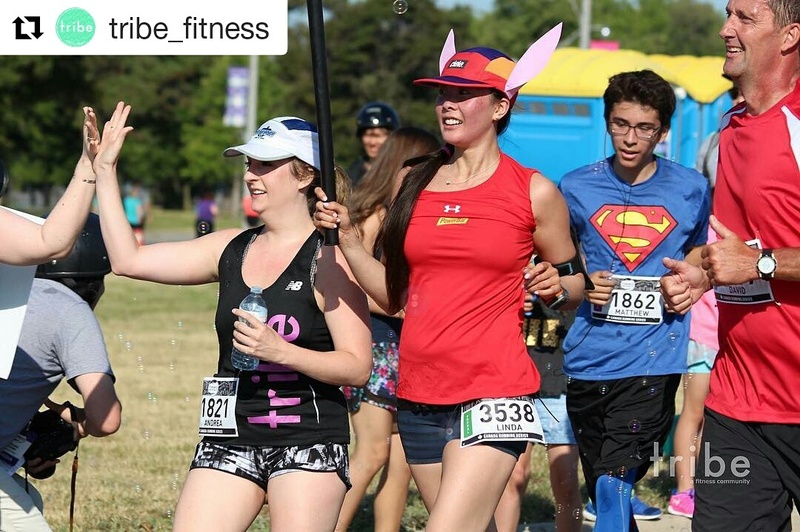 Tribe Fitness also hosted a cheer station that sprayed water guns as well so it was fun to get soaked in the heat. There were a lot of volunteers at the water stations along the course, at the beginning and at the party site. They were all very friendly and was cheering everyone on. There were a lot of spectators and Toronto run crews out for this inaugural 10k race. The energy was great and it was really nice to run and see familiar faces cheering you on. Tribe Fitness and Pace and Mind hosted two cheer stations along the route filled with music and Tribe even had a kiddie pool and spectators shooting water at you from their water guns. Since this was a race in the summer, the water gun cheer station was an amazing idea! I loved it and it felt so refreshing on a hot day. The post race party was so fun! There were three photographers after you finish the race to take professional finisher photos for you. There were bananas, muffins from Panera Bread (cinnamon and cheese), cookies and Oasis juices and protein shakes. One unique and fun thing about this post race party is that it was also a Carnival “Rio Send-Off” for Reid Coolsaet, Eric Gillis and Krista DuChene as they head to Rio for the 2016 Summer Olympics. There were Brazilian drummers and samba dancers. The carnival concluded with the three Rio-qualified athletes being presented with a Canadian flag that we had the chance to sign during the packet pick-up. The athletes were also available post-race for photos and autographs at the Canadian Olympic Foundation booth.